It’s true: my LARP (live action role playing) experience has helped me get full-time office jobs and notable freelance gigs. Depending on your field, mentioning LARP during your interview can increase your chances of success. It may not be evident whether you could or should mention LARP specifically during your interview. If you’re interviewing for a creative position, it’s likely that mentioning LARP can help you stand out. Even if you’re going for an administrative position, your LARP-related experience can help, depending on what you do for a game. What works for me: Aside from writing a great deal about LARP, I’ve also marketed a medieval fantasy game. This helped me bring my SEO copywriting skills more into the marketing field. This shows that I’m great at selling something I’m passionate about – and that’s really desirable in any kind of marketing job. In the obviously creative job interview, I’ve gone all out about my experience. After dozens of other interviews with people who might be better looking or more experienced than me, what have I got to offer that makes me look different from the rest? The truth. I’m super involved in LARPgames and I have no regrets. In the somewhat creative job interview, I mention LARP as ‘improvisational theater’ and lump it in with my other theater experience. In a super stuffy interview, if I don’t feel comfortable at least mentioning theatrical experience, I avoid it entirely – and avoid accepting that type of job, because likely it’s not the right job for me. When is the Right Time to Mention LARP in a Job Interview? Name a time you had to work with someone really crazy. Tell me about how you overcame a major challenge. How do you work with people who disagree with you? Are you comfortable speaking in front of crowds? Because let’s be real, those moments always happen in-game. On a resume, mentioning LARP can get a bit tricky. It’s not like an interview – that allows you to judge how much you should talk about a subject, if at all. I do have my LARP marketing experience on my resume because it is the only face-to-face marketing I’ve done, which is a very important skill. However, I tend to focus more on the metrics and job responsibilities than the whimsical and creative aspect of LARPing. And at this point in my career, I’ve decided that if someone can’t handle my LARP habit, then it probably isn’t a good fit anyway. 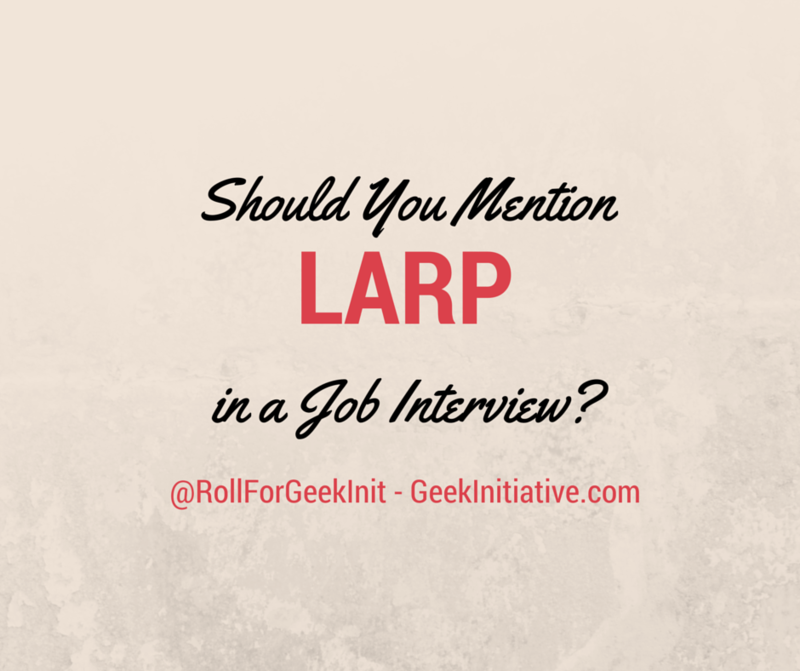 Have you mentioned LARP during a job interview? How did it go?